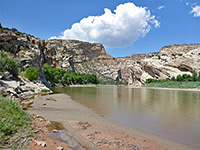 Deerlodge Park is a partly wooded flat beside the Yampa River, at the edge of a much larger area of meadowland (Lily Park), right at the eastern edge of Dinosaur National Monument, in Colorado, just west of a line of sandstone cliffs that rise up quickly and impound the river in a deep, twisting and largely inaccessible canyon for its lower 43 miles, up to the confluence with the Green River. 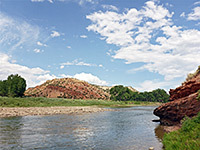 This region is not often visited, despite being reached by a paved road, terminating at a primitive camping area (tent sites only) beside the river, the waters of which are usually wide but shallow, bordered by extensive sandy beaches, hence this is a good place for water-based recreation in the summer months. 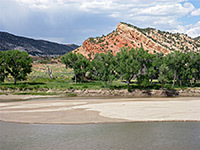 This section of the national monument is usually unstaffed and has no other facilities, apart from one short path, the half mile Steps Trail, which crosses a ridge formed of inclined strata and descends to a minor tributary drainage at the mouth of Yampa Canyon, where the land either side of the river slopes up by 800 feet, at a constant angle of 12 degrees. 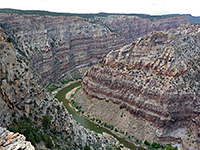 A relatively easy, off-trail continuation is to climb the slope to a lookout point on the far side, which gives fine views down the canyon, as the river is now confined between huge, stepped, reddish cliffs. The round trip hike to this point is about three miles. The paved side road to Deerlodge Park leaves US 40 about half way between Dinosaur and Craig, and ends after 12.5 miles at the campground, initially descending a shallow valley (Twelvemile Gulch) then following close to the south side of the Yampa River, overlooking the flats of Lily Park to the north. 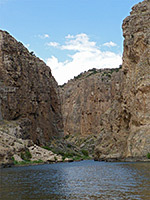 One worthwhile stopping point along the way is at the mouth of Cross Mountain Canyon, where the Yampa River emerges from a straight line of limestone cliffs up to 500 feet tall, flows over some minor rapids then continues westwards over wide open land; a feature of reminiscent of Santa Elena Canyon in Big Bend National Park, Texas. A spur leads to a picnic area close to the base of the cliffs at the canyon mouth. The main road divides at its far end, one branch leading to the Steps trailhead, the other to the camp area. This includes a ranger residence, registration station and day-use parking area, adjacent to the tent campground. 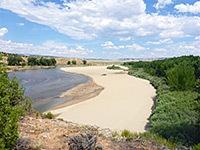 The camp contains just seven sites, spread across a wide grassy flat shaded by ancient cottonwood trees, a short walk from the edge of the river; all this area is subject to flooding during the spring runoff. Further west, the river is edged by scattered trees and brush, crossed by a faint path, though the walking is easiest alongside the sandbanks beside the water, and the Steps Trail can be accessed this way, or by driving along the other fork of the road. 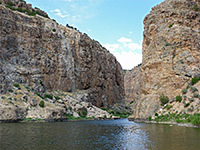 The Yampa River canyon begins 1.3 miles west of the campground. The Steps Trail begins at the west end of the road, half a mile from the campground; through a gap in a fence, up slightly and across a little ravine, within sight of the river. The route initially crosses light grey rocks of Glen Canyon Sandstone, then moves on to the red and orange layers of the underlying Chinle Formation. 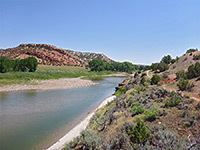 The terrain levels out as the trail follows the edge of a flat bench about 40 feet above the river, veering away slightly towards the end as the land slopes down to the wide valley of Disappointment Draw, mostly treeless apart from the lower end, where the usually dry streambed winds through a wooded patch. 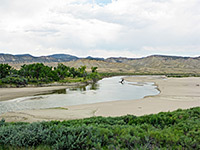 The path seems to move upstream and fade away, though the obvious destination is a beach beside the river at the mouth of Yampa Canyon, reached by a short walk down the creek bed. 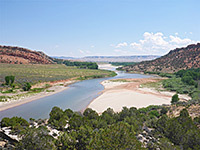 On the far side of the river is a similarly sad-sounding valley, the Vale of Tears, bordered to the east by more extensive outcrops of the layered, red Chinle rocks. 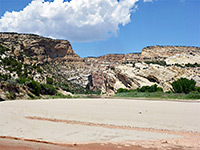 The east side of both valleys is composed of tilted Weber Sandstone, sloping steadily up to form a dramatic start to Yampa Canyon. 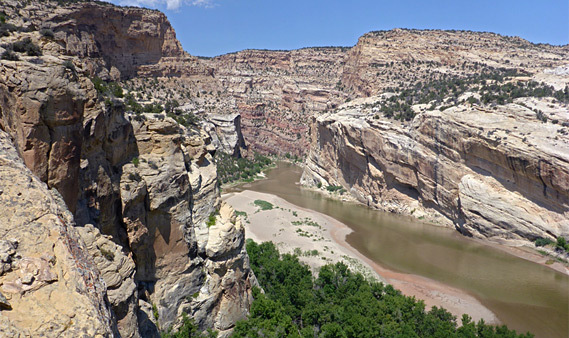 The river at the canyon mouth flows past a wide sandbank then soon becomes cliff-bound. All this area is much frequented by cattle. The big sandstone slope to the west is crossed by a few shallow ravines and is moderately overgrown, but holds no major obstacles, so it is relatively easy to climb to the top, perhaps staying close to the north edge of the cliffs for a few hundred feet then following a northwest-trending gully, in total rising nearly 800 feet to the flat crest on top. The ridgetop is lightly wooded, and there are no immediate views of the canyon ahead, but this soon comes into view after a short onwards walk, slightly downhill, to the cliff edge. 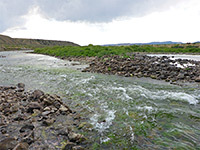 Directly below is the lower end of a north-side tributary, Happy Valley, downstream of which the river bends by 90 degrees and continues northwestwards, its canyon gradually becoming wider and deeper.